Woodard Maurice Ritter is hardly a name anyone would expect to see on a theater marquee, but fortunately for the young man who was named after the doctor who attended his birth (Dr. S.A. Woodward of San Angelo) grew up working on the family farm in Panola County, "Tex" was a natural and marketable sobriquet. By the time little Woody was born in 1905, the Ritter farm had been in the family for nearly seventy years. He went to South Park High School in Beaumont, and in 1922 entered the University of Texas at Austin. He probably told his folk that he joined a musical troupe to pay his way into Northwestern University Law School, but by this time the acting bug had bitten hard. Woody became Tex when he got up North. He had gained some showbiz experience singing on KPRC Houston in 1928, and once he got his feet wet in Chicago, it was only natural that Tex would move on to New York. He landed a few chorus spots and was asked to sing four songs as cowboy Cord Elam in Green Grow the Lilacs (1931, 64 performances), the play which was the inspiration for the Rogers and Hammerstein musical Oklahoma! (1943, 2,212 performances). Although Lilacs was less successful, in addition to his four songs Tex got to understudy star Franchot Tone for the lead role of Curly. 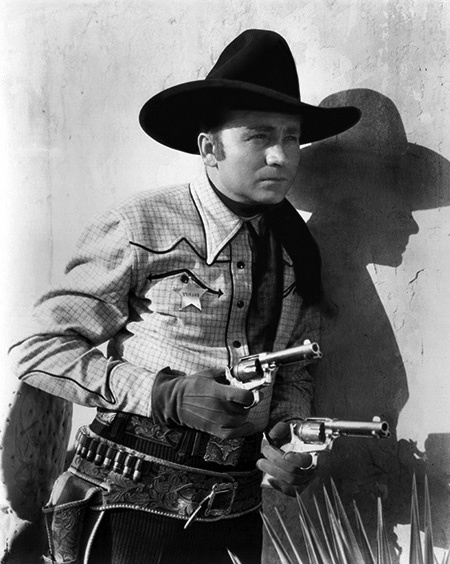 In 1932, Tex starred in The Lone Star Rangers on WOR New York, singing cowboy songs and telling tales of the old West, but four years later he answered the call of the movies and moved to Hollywood. Tex got his start in B-grade Westerns for Grand National Pictures, including Trouble in Texas (1937) co-starring Rita Casino, who would soon be known as Rita Hayworth. After leaving financially unstable Grand National, Tex would make around forty "singing cowboy" films between 1938 and 1945. In several of these, he was costarred with Arizona-born songstress Dorothy Fay, whom he would marry in 1941. Ritter's film career peaked when he signed with Universal, making The Old Chisholm Trail (1942), The Lone Star Trail (1943), Raiders of San Joaquin (1943), Cheyenne Roundup (1943), Arizona Trail (1943), Marshal of Gunsmoke (1944) and Oklahoma Raiders (1944). When Universal ran into financial troubles and Singing Cowboy films began to fall from popularity, Tex concentrated on his recording career. He topped the Country charts with "I'm Wastin' My Tears on You" (1944), followed up with a Number 2 hit "There's a New Moon Over My Shoulder" (1945). He continued to have a presence in the charts for the next several years with hits like: "You Two-Timed Me One Time Too Often" (1945, Number 1), "You Will Have To Pay", "Christmas Carols by the Old Corral", and "Have I Told You Lately that I Love You?" all from 1946, "Rye Whiskey", "The Deck of Cards", and "Rock and Rye" from 1948. Ritter was one of the driving forces in the creation of the Country Music Hall of Fame, and he was inducted into the hall himself in 1964. The next year, he moved to Nashville to work for WSM on The Grand Ol' Opry. In a surprising move, Ritter ran for the United States Senate from Tennessee in 1970, but despite phenomenal name recognition and popularity, was defeated in the Republican primary by Representative Bill Brock who would go on to defeat incumbent Al Gore, Sr.
Tex and Dorothy remained together for the rest of his life, and they had two sons together, Tom (b. 1947) and actor John (1948-2003). Ritter suffered a fatal heart attack on January 2, 1974, just a few days before his 69th birthday. A Star on the Hollywood Walk of Fame at 6643 Hollywood Blvd was dedicated honoring contributions to Recording by Tex Ritter. Tex and John Ritter are the first father-son duo to be honored on the Walk with Stars in different categories. John's Star for Television in next to his father's at 6643 Hollywood Blvd. Be the first to comment on "Tex Ritter"